A number of recent studies suggest that dressing up for work in a suit or blazer could do wonders for an employee’s productivity, whether going into a negotiation, making a sales call or even participating in a videoconference with business associates. Using a number of measures, including simulated business meetings at which subjects wore formal and more casual clothing, the studies offer indications that wearing nicer clothes may raise one’s confidence level, affect how others perceive the wearer, and in some cases even boost the level of one’s abstract thinking, the type in which leaders and executives engage. Michael W. Kraus, an assistant professor of organizational behavior at the Yale School of Management, co-wrote a study for the Journal of Experimental Psychology in 2014 which showed that clothes with high social status can increase dominance and job performance in “high-stakes” competitive tasks. 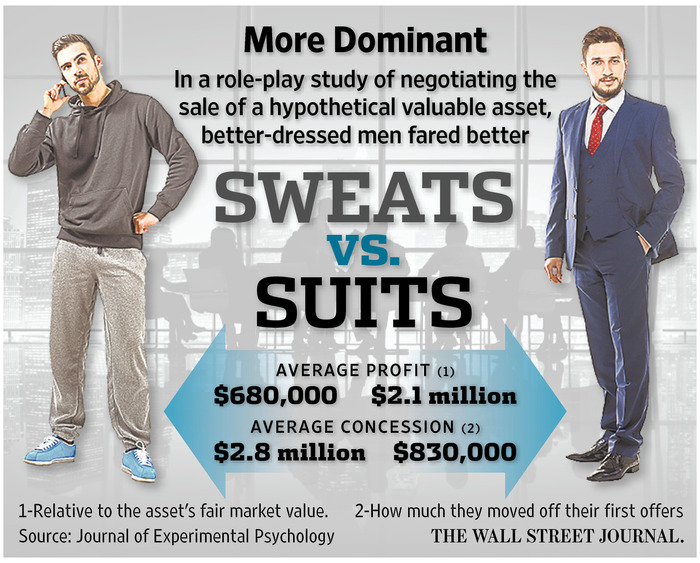 The study put 128 men ages 18 to 32 with diverse backgrounds and income levels through role-playing exercises—mock negotiations over the sale of a hypothetical factory—to see whether wearing specific kinds of clothing had an effect on the outcomes. The “buyer” in each case came from one of three groups. One group wore business suits and dress shoes. One group wore sweatpants, white T-shirts and plastic sandals. A third group, referred to as “neutrals,” kept wearing the clothing they arrived in. A neutral played the role of “seller” in each negotiation, but no seller also played a role as a buyer. The negotiators were each given a fair-market value for the hypothetical factory, along with other information that would influence their decisions about opening bids and asking prices. In the end, the suits proved much less willing to concede ground during the negotiations, moving off their initial offer by an average of only $830,000, compared with $2.81 million for those in sweatpants and $1.58 million for the neutrals. What these results show, Prof. Kraus says, is that in competitive, winner-take-all situations, wearing more formal attire can send others a signal “about you being successful and real confident in whatever you’re doing.” Those more casually dressed, on the other side of the table, tend to back down more easily, he says. The ones in formal attire become aware of the respect they are receiving and become more forceful as well, he says. Other research suggests that the effects of wearing nice clothes can be as much internal as external. In a study published last year in the journal Social Psychological and Personality Science, results suggested that people engage in higher levels of abstract thinking when they dress up, compared with when they dress casually. When some 361 participants were asked to complete tasks, the ones dressed more formally engaged in the kinds of abstract thinking that someone in a position of power, like a senior executive, would deploy. After being tested in both formal and casual dress, another 88 subjects were quicker to see the big picture when they dressed more formally. The casual dressers tended to sweat the small stuff. In an office with a relaxed or business-casual dress code, “when you don’t need to wear formal clothing, that’s where wearing formal clothing can have a bigger effect,” he says. What kinds of clothes qualify as formal or higher-status dress, of course, can depend on the industry or whom you talk to. Fashion consultants offer some insights that could be useful in any number of businesses. “Put it up a notch, but not such a big notch that you’re going to make everyone else in the office uncomfortable,” says Annie Brumbaugh, founder of AB Wardrobe Works, a personal-wardrobe consulting firm. For women, that could mean a tailored jacket, especially for an important meeting. “Say you’re wearing pants and a top or a skirt and a top, [the jacket] is what gives you some finish and authority,” she says. Also, “Wear heels when it’s important,” like when going into a meeting. One option: Those who don’t want to walk in heels all day can keep a pair at the office. For men, a full suit, sport coat, or even a tie can put you in a more professional mind-set, says Julie Rath, a men’s style consultant and founder of NextLevelStyle.com, an online style course for men. If wearing a suit will come off too strong, Ms. Rath recommends focusing on fit (sleek and close but not tight) and quality (good cashmere, fine wools or 100% cotton). Wearing a high-quality dress shoe or nice watch can do the trick as well, she says. Sometimes a small fashion adjustment can have big results. Don’t go looking too far afield if searching for a model of success to imitate. While Mark Zuckerberg seems to have done pretty well in business wearing hoodies and jeans, experts say he’s an outlier. Mr. Smith is a reporter for The Wall Street Journal in New York. He can be reached at ray.smith@wsj.com. A sense of style comes across quickly when people meet. Some men and women have a natural sense of what works, what looks great, but others don’t have a clue. Wouldn’t it be a shame to not be considered for a position because we didn’t just get a little help with what would work for us? Dressing for success isn’t a burden, it’s actually fun. Don’t be shy, be bold! I could not agree more with this WSJ article on dressing for success! Ironically, I went on a job interview just this morning wearing a Calvin Klein suit and blouse. Normally, I wear jeans to work in my current position as a Night Supervisor in the field of Human Services. It definitely felt good to “suit up” again..